Ginger has been used for centuries for its calming effects on the digestive system. While the taste of ginger is distinct enough to make it a main ingredient in some desserts, its ability to soothe an upset stomach has earned it some quiet fame with those who prefer to holistic healing at home. Ginger root offers a multitude of health benefits and because it’s a root, it can be saved and used in a variety of forms. Unlike many teas, ginger can be used fresh – it does not have to be dried or ground to be used in a tea. The ginger root can be sliced to be made into tea. Slice a portion from the root and let it steep for about 15 minutes. You can also use ginger to enhance the flavor of another tea or add honey to sweeten. If you don’t have access to ginger root, there are many ginger tea bags ready for dipping online and in stores (see our reco here). Another alternative is to add a drop of essential ginger oil in a cup of hot water for a quick cup of tea. Drink it alone or combine it with other teas that offer additional healing benefits. For instance, if you can’t sleep because you aren’t feeling well, combine the sedative effect of chamomile with the soothing effect of ginger. Here are some specific benefits from drinking ginger tea. Ginger is best known for its ability to aid the digestive system. It causes the secretion of digestive fluids, making it easier for the digestive system to process foods. However, ginger is strong so it may also cause heartburn if not used in moderation. If you’re nauseous, a glass will sooth your tummy, but that’s not the only result you’ll see. It also aids in reducing flatulence, colic, diarrhea and cholera. Ginger is a natural blood thinner and can be used to aid in headache relief. If you drink it, you shouldn’t take aspirin since the combination of the two blood thinners could have dangerous results. Both blood thinners work to stop headaches by reducing inflammation of the blood vessels as they thin the blood. You can also use ginger tea to reduce the impact of a migraine under the same blood thinning principle. The key is to consume the tea before the migraine has reached its peak. Tea made with ginger root can also reduce your risk of heart disease. It lessens the amount of cholesterol absorbed through the blood and liver. Lower cholesterol means a lower risk of a heart attack. This tea also has the ability to reduce joint inflammation, a condition that can lead to other health problems as the inflamed and painful joints cause you to exercise less. While its tea makes a great antidote for an sick stomach, another quick trick if you don’t have ginger tea available is to drink a glass of flat ginger ale. Allow the glass to sit until the carbonation is gone and it has stopped bubbling. Drinking ginger in tea form is a better source to aid an upset stomach, but soda will do in a pinch. The reason this ingredient is so effective to sooth an upset stomach is because it has the ability to neutralize stomach acid. Because ginger tea is so effective in reducing conditions like inflammation and nausea, it also leads to healthier habits. If you aren’t feeling well or are in pain, you aren’t going to be motivated to do much of anything. No matter what kind of medicine you take, a lack of exercise will lead to serious health problems. When you are feeling good and are living pain-free, you’ll find that you naturally have more energy. Aside from all the things that ginger does to the body in tea form, it’s also beneficial as an aromatic tool. The scent alone can be calming. Just add ginger to heated water and gently inhale to experience its calming smell. 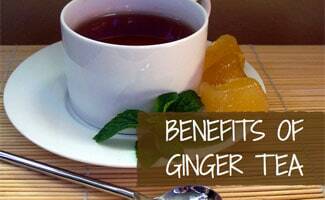 Another way you can use ginger to your benefit is by adding it to a tea you already drink. The taste goes well with almost any other tea. You can adjust the strength of the flavor by using a smaller root or removing the root from the tea after a shorter or longer period of time, depending on your preference. No matter how you decide to use your ginger or ginger tea, use it in moderation. Herbs can be as dangerous as any prescription drug if they are used in excess. Want to grow your own ginger? This video shows you how to plant store-bought ginger root. Why do you drink ginger tea? Great post. Other than the associated health benefits of drinking black tea, many people do not know that it packs roughly half the amount of caffeine as coffee! So not only are you exposing yourself to all these great health benefits, but it’ll also be a great replacement to coffee or other sugary energy drinks.